Banana Split Dessert is classy, elegant and perfect for summer. 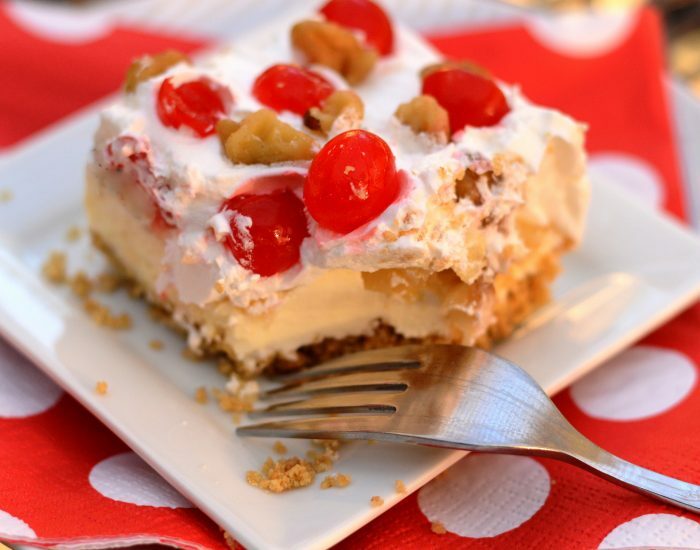 Reminiscent of that extravagant treat you could once find at your neighborhood soda fountain, this one has it all–bananas, pineapple, maraschino cherries, whipped cream–and more!–all layered together in a 13 x 9 pan. The recipe has been around for a couple of generations now. It takes a bit of time to prepare (but not too long! ), but oh, baby, is it worth it. In fact, often my daughters will ask for this beautiful dessert in place of their birthday cakes. Just sweet enough, creamy, cool on the tongue–and with all the flavor explosion of tangy pineapple, crunchy nuts, and juicy cherries–this dessert will fast become your family’s favorite, too. Go on. Invite the whole gang over. They’ll be impressed. Mix graham cracker crumbs, melted oleo and sugar. Pat evenly in a 13 x 9 pan. Mix together eggs, 2 sticks oleo and powdered sugar and beat NO LESS than 15 minutes. Spread on graham cracker crust. Sprinkle with walnuts and maraschino cherries.